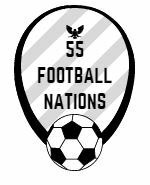 55 Football Nations is about the full football experience. The fans, the match itself and the stadiums. Or grounds. My journey over the Irish Sea was to matches at two very traditional grounds in Bray and Belfast. The Carlisle Grounds has a long history as a sports arena. It is now home to League of Ireland side Bray Wanderers. It has a fresh, seaside feel, located just back from the Victorian promenade. An old iron sign spells out the letters of the home team. A jackdaw rested upon it. A passing woman had spotted my gaze. “I’ve never noticed that” she says. “I’m not sure the bird is always there” I respond. “No, the sign, I only moved to Bray last year.” I took a photograph of a memorial outside the ground, two floodlights blurring behind. “That’s for those fallen in the Second World War” explained an elderly man. Two people had spoken to me in a couple of minutes. If this was London, I would have called the police! The ground has had recent touches towards modernisation. I sit in the low-slung west stand for the first half. A three foot concrete wall was all that separated me from the action. The sky was lit up by the dying sun, clouds hovered low over the housing in front of me. The sea was just metres behind. Bray Head, a steep incline of dulcet colours, was visible to the south, a cross on its peak, a truly magnificent view eclipsed by a bowling alley. I stood on the east terrace for the second half. My experiences at Craven Cottage have been homogenised by sitting in the same seat. I look back fondly at the days when I shuffled across the Enclosure, now part of the Johnny Haynes stand, at half time to follow Fulham’s often stuttering attacks at close range. I enjoyed the change of perspective at Bray. A small clutch of vocal young Bray fans stood nearby, a cluster of Drogheda United fans sat below. The sun set and turned the clouds an inky black on the horizon, they moved like a volcanic eruption away from the hilly County Wicklow backdrop. Those standing behind the advertising boards got a unique view of an untidy goalmouth scuffle and Drogheda’s consolation in a nervy 2-1 home win. The following day I visited The Oval, home to Glentoran in East Belfast. The Oval is a throwback ground, many moons away from the interchangeable stadiums of the top two divisions in England. Photogenic and decrepit terracing circled the ground. A precarious main stand loomed over the pitch. A smaller sister stand was dwarfed by the yellow cranes of Belfast docks. I walked through the players’ tunnel. It reeked of past games. The stairs up to the main stand felt like they had not changed since Glentoran icon Sammy Hughes was banging in the goals in the 1950’s. A wonderful glass mural of Hughes was beautifully lit by the sun. I watched the first half with Thomas Weber, a Kaiserslautern fan and keen groundhopper, who visibly salivated over the history at The Oval. We sat amidst the knowledgeable home faithful on the tight wooden seats. A tremendous view is offered of the game below. Many home fans moved to the terraced curve behind the Glentoran attack just before the second half. Sun shifted to rain and they trotted back to the lower seats with knowing faces. The weather is wild in Ireland. The rest of the game is tame. A scrappy 1-1 draw. I also visited Solitude, home of Cliftonville, in north Belfast. It was as quiet as the name would suggest. No match was taking place. The White House, an Irish take on the Cottage at Fulham, sat innocently in the corner of the ground. It is in poor shape, tiles displaced on the roof, damp visible. “If I won the lottery, I would fix this up” commented Stephen McKillop, the club’s finance director. I would too. The Carlisle Grounds, The Oval and Solitude connect history with the modern game. A really interesting article – but the White House is not a patch on Craven Cottage!! I love what you’re doing, Matt. Very jealous!